Three miles from over 100 world class Washington wineries and tasting rooms. 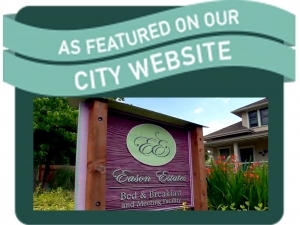 Eason Estates Bed and Breakfast is part of the historic James Skirving House in Bothell, Washington. The turn of the century architecture and beautiful gardens will transport you to another time and place in a comfortable, warm and friendly setting. Owners and proprietors Shaun Evans and Beth Rosenzweig have lovingly restored and renovated their home in order to preserve its unique character and make it accessible to visitors.